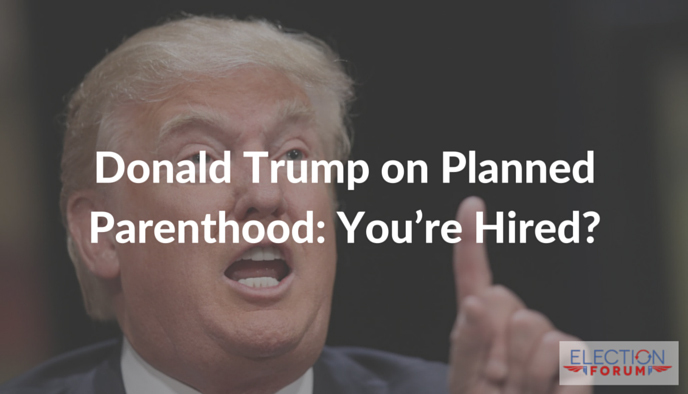 Donald Trump on Planned Parenthood: You’re Hired? Planned Parenthood should not receive federal taxpayer funding. It’s not the responsibility of the federal government. And it’s immoral to force those opposed to abortion to pay for it directly or indirectly. Many Reality Alert readers have been confused by the back and forth between Ted Cruz and Donald Trump. Planned Parenthood is a well-known abortion provider. Recent undercover videos exposed Planned Parenthood operatives selling the body parts of aborted babies. Gianna Jessen, who survived an abortion, testified to Congress how abortionists today will kill children rather than allow them to live, even if they survive an abortion. And yet Donald Trump is still willing to support Planned Parenthood if they stop abortion. Yet Donald still claims that he is pro-life despite his support for the institution. Is the abortion part really a small amount of what Planned Parenthood does? Planned Parenthood spokeswoman Cecile Richards acknowledged in House Oversight Committee hearings that in fact 86% of funding goes toward abortions! This heinous use and abuse of funding brings up another fundamental question: What role does the federal government play in these institutions in the first place? So which is? Will a President Trump say “You’re Hired!” or “You’re Fired!” to Planned Parenthood? PPH is not supported by Donald Trump, period. He has stated many times he would stop funding to PPH. Let’s get the facts straight! I’m 100% pro-life and I did stop sending $$$$ to PPH. What has the GOP done to PPH? I agree with Leo, please update this information with the truth! Donald said he would ban abortions.